Magerealm, the hit 3D action MMORPG from GTArcade, is hoping to make a splash with its FIRST SSS Hero! 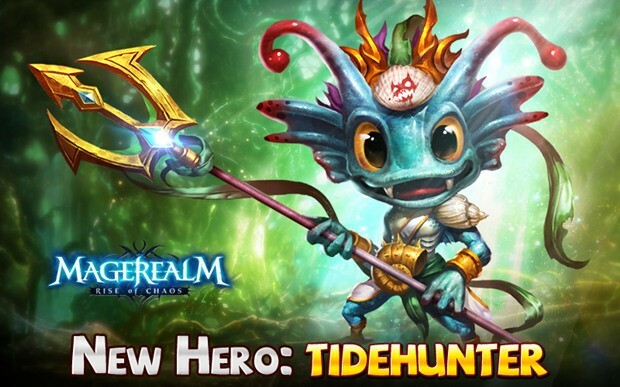 Introducing Finley Tidehunter, an ancient aquatic with the powers of the ocean at his call! Merfolk often tell tales of an ancient race of sea dewllers that hold powers beyond imagination. But even for the underwater natives, these ancient beings have been nothing but myths passed through the generations. This all changed when Finley Tidehunter emerged from the depths. The strange little creature caused quite a commotion when he first emerged from the sea, being the first of his race to ever appear on the surface world. Mage scouts sent to assess the situation observed no ill intent from the small visitor, and the Mage Council has since requested Finley’s aid in the war. Finley eagerly agreed, viewing it as a good way to experience the surface world. Don’t be fooled by his size and playful nature, while Finley is considered an adolescent for his race, he is actually hundreds of years old. With a child-like curiosity, Finley lives for adventure, often grabbing his trident and wandering off without a moment’s notice. Having wrestled with all manners of deadly sea creatures during his travels, Finley developed a natural toughness and tenacity. Impressively, Finley has already explored almost the entirety of the vast oceans, and so set his sights above the waters. Despite his small stature, Finley is an offensive orientated tank hero with truly impressive skills to back it up. His passive skill Bubble Shield greatly enhances his survivability by boosting damage reduction and allowing him to constantly dodge attacks, allowing him to mitigate vast amounts of damage. With the Ocean’s Fury, Finley borrows from the turbulent seas to gain a stacking buff that increases both his damage and mitigation, making him sturdier and more dangerous as fights drag on. Finley has a number of offensive skills to round out his role as an offensive tank. His Tidal Wave is a circular AOE that will deal heavy damage to all surrounding enemies. Meanwhile his Cold Abyss skill will render a target disabled and greatly weakened for the rest of his team to finish off. Finally, Ancient Beast is Finley’s last and most game changing skill. Able to briefly attain the full powers of his race, Finley grows to an immense size, significantly increasing his damage and mitigation while becoming immune to status effects. Excited to see this new pint-size Hero in action? Follow Magerealm on Facebook to get the latest news and participate in rewarding events!